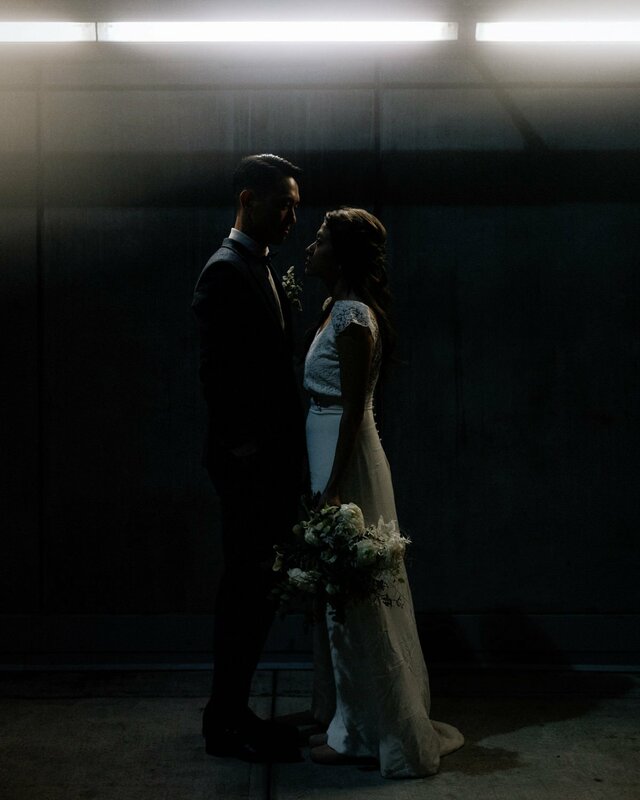 To kick off my 2019 season (also my ninth year as a wedding photographer) with these two Amsterdam living, Vancouver loving humans was a rare treat. Chloe & Zechy opted for an intimate and minimalist wedding at the Contemporary Art Gallery complete with a nod to Chloe’s upbringing (as a daughter surrounded by art and artists) and their mutual appreciation of hygge as way of life (something their second home of Amsterdam has undoubtedly instilled in them). We let our laughter warm us in a wind tunnel beneath the city. Chloe spent the morning enjoying the company of her family as if it were any other day. Ghost chairs, crisp linens, and ikebana style floral arrangements were the minimalist wedding ideas made real thanks to the vendor dream team headed by the incomparable Jordan Maxey of Smitten Events. A husky led them to the first look location in a park close to home. We embraced winter with our wool coats, flannel suits, and fur stoles. A fuzzy wombat and a thoughtful panda made an appearance—and an impression on us. And when 13 years of history culminate in a cozy celebration with the very closest in your lives, you can be sure I’ll have loved every moment of being there with you. On their wedding day: To celebrate with friends and family. To take it slow and savour the day. The act of making a formal eternal commitment to each other and having our closest friends/relatives share in the experience. Hair & Makeup: Denise Elliot Beauty Co.